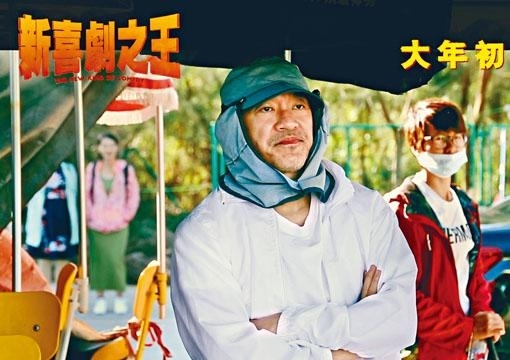 Stephen Chow Sing Chi's movies have brought everyone endless joy. As a director he was a "tyrant" about his actors' performance. In the latest NEW KING OF COMEDY special "Director's Rage", director Chow Sing Chi displayed how strict he was about the details of the film and actors. At the time the video also showed a walk on the waves poster, as Wang Baoqiang, Vin E Jingwen and others put on funny costumes and walked on the waves in AN ACTOR PREPARES with bold spirit. Sing Yeh said, "You don't look right at all, what are you doing?" On the KING OF COMEDY set, Sing Yeh had to turn every actor upside down and inside out for honing. When anyone's performance did not meet Sing Yeh's demands, he shook his head, pouted and buried his face into his hands to express his displeasure. Sing Yeh did not show any mercy for even the actor's speaking tone or even a single word of "oh". In the special, lead actress E Jingwen was baffled once. "Wasn't that a good take? We still need another one." Sing Yeh asked E Jingwen, "Do you want to continue or just leave it like this?" E Jingwen said, "Because this is Chow Sing Chi's movie, I have to perform Chow Sing Chi's style." Each actor under Sing Yeh's strict demands achieved their best. Although the special showed Sing Yeh "hammering" the actors and the continuously suffering the actors had during the shoot, but after meeting the director's demands in the end they were still able to ge Sing Yeh's recognition.